QuickAffiliatePro Review - Is It A Legit Affiliate Marketing System? →QuickAffiliatePro Review – Is It A Legit Affiliate Marketing System? QuickAffiliatePro Review – Is It A Legit Affiliate Marketing System? Welcome to my QuickAffiliatePro review, a program that promises 1-click SEO-optimized websites! 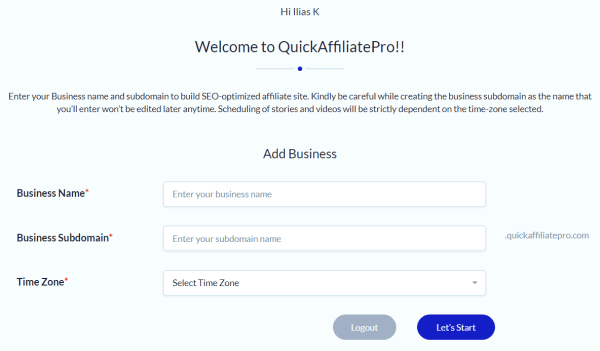 On this review, you can read what is QuickAffiliatePro, how it works, and my opinion about some of the claims that sound too good to be true. The best way to describe the program is as a software that is supposed to create money making websites. Based on this software which is not great, the owner has developed a system and he promises a lot of traffic from search engines and social media. I think QuickAffiliatePro is for people who believe they can find a system that makes money on autopilot. It does not educate you about affiliate marketing, SEO, social media or anything else. It is only a software that creates sites with subdomains and you publish articles and videos from other websites on your site. Of course, there is no value for the visitor on this process so your chances to earn money are limited. Also, the program includes some tools that are supposed to help you with SEO and social media. The name of the owner is Dr. Amit Pareek and from a quick research, I discovered he has created many courses in almost any niche of online marketing. I do not know if he has any success as an affiliate marketer because I can’t find any results or his automated websites but it’s obvious that his main job is to create programs about online marketing. Most of his products have not good reviews. 1. Put an RSS URL to curate content from any website to your website. 2. Add your affiliate link, offer link or your lead form to the content. 3. Share the post to the top social media platforms. There are some tools to support this system as well. There is an SEO tool that adds meta titles and meta descriptions, a tool that shares the content to the social media and the software can find content and add it on this site. First of all, SEO does not work like that. I am an affiliate marketer and I get most of my traffic from search engines. To get traffic from Google, you need unique and quality content. On the presentation of the program, it is mentioned that is hard to create content which is not true. But it does not really matter if it’s hard or easy. This is how it works. If you want traffic from SEO, you must create content (or hire someone to create it for you). Poor or duplicated content does not work. Also, you can find plugins that add meta titles and meta descriptions for free! The same applies to the social media tool. You can find free plugins to share your content. All the program is based on the 1-click websites. To build a website, you just add the name of the site, the URL, and your time zone. Then it creates a subdomain. When I created the first website, simply it did not work. It just redirects to the homepage when this review is written. Probably, it’s a technical problem that they will fix in the future. However, here is how it looks in the members’ area. There are options to add posts from other sites, YouTube videos, form to get emails and legal pages. It was not easy to figure out the total cost of the program with the upsells and downsells. There are three types of membership. You can start with $17 but if you want more of these blogs with the curated content, you can pay up to $35.17. However, there is a popup that offers a free trial for 14 days without adding any payment details. When you are inside you are going to see many upsells. According to their JV page, the total cost for the buyers will go over $5000 if you decide to buy all the upsells. Free trial: It’s always a good thing to check what you are going to get before deciding to invest in a program. This option is not obvious and you have to wait for a popup. False claims: The “instant 1-click SEO optimized websites” it’s not true. There is a tool inside to add the meta description manually. Also, the “fresh” content is content from other sites and videos from YouTube. Sites with a subdomain: The subdomains have less SEO value than the premium domains. Also, the authority of .quickaffiliatepro.com subdomains is close to zero because it’s a new website. The SEO system does not work: As I mentioned above, you need quality and unique content. You will not get ranked on the first page of Google by adding posts and videos from other sites. These websites do not add any value: Why should someone visit your website? You get videos from YouTube videos and articles from other sites and add them to a site with a subdomain. It does not make sense. I would go directly to YouTube or these posts if I wanted to visit them. What are the sites you visit daily? Sites with duplicated content from other sources or sites and blogs that produce their own content? I think the answers to these questions are obvious. There are many programs about affiliate marketing that do not really help the buyers. QuickAffiliatePro is just one of these poor quality programs. You do not have to pay to get some subdomains and a tool to share content on social media. You can find them for free! Sorry, but there are no shortcuts to affiliate marketing. While it’s a simple business model because you do not have to own a product or handle customer service, it still takes work. You need to learn how to SEO a website and your articles. It is not hard to write a few posts or create some YouTube videos. Writing and speaking are the easiest things you can do to make money online or offline. If you check the top affiliate marketers, you will discover that all of them create content consistently. Creating content means communicating with other people. You do not have to be a writer or anything complex. Click here to learn how I make money with affiliate marketing! Thanks for reading my review on QuickAffiliatePro. You can leave any comments or questions below.